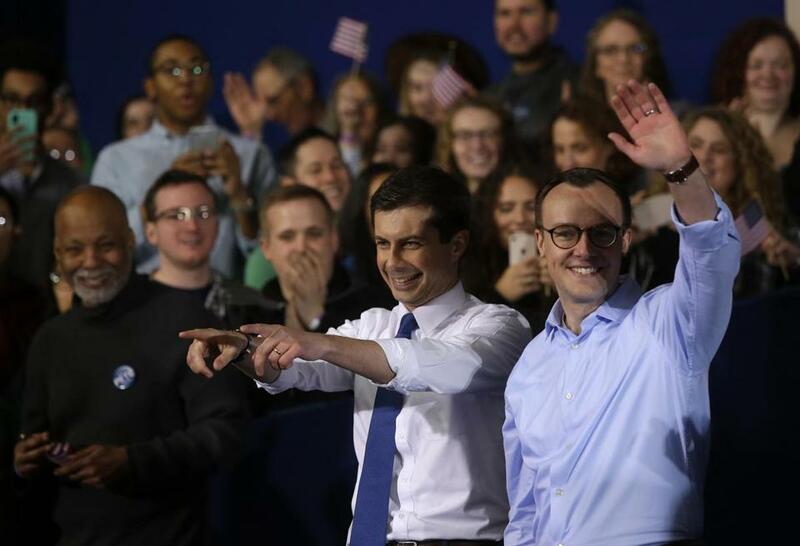 Pete Buttigieg (left) acknowledged attendees with his husband, Chasten Buttigieg, after announcing his presidential candidacy for 2020 during an event on Sunday in South Bend, Indiana. SOUTH BEND, Ind. — Pete Buttigieg, the little-known Indiana mayor who has risen to prominence in the early stages of the 2020 Democratic presidential race, made his official campaign entrance Sunday by claiming the mantle of youthful generation ready to reshape the country. ‘‘I recognize the audacity of doing this as a Midwestern millennial mayor. More than a little bold, at age 37, to seek the highest office in the land,’’ he said to cheers of ‘‘Pete, Pete, Pete’’ from an audience assembled in a former Studebaker auto plant. Our candidate tracker takes a look at who has announced that they are running for the presidency. ‘‘Right now, it’s pretty fun,’’ Buttigieg told The Associated Press last month while visiting South Carolina , where he was met by larger-than-expected crowds. His challenge is finding a way to sustain the momentum over the long term and avoiding becoming a ‘‘flavor-of-the-month’’ candidate. Scrutiny of his leadership in South Bend has increased, as has his criticism of Vice President Gov. Mike Pence , who was Indian’s governor when Buttigieg was in his first term as mayor. Buttigieg also says the best way for Democrats to defeat Trump may be to nominate a mayor experienced in helping to revive a Midwestern city once described as ‘‘dying,’’ rather than a politician who has spent years ‘‘marinating’’ in Washington. He has criticized Trump’s campaign slogan, ‘‘Make America Great Again,’’ saying the way to move the country forward is not to look backward or cling to an old way of life.